Valentine's day is right around the corner and it's one of my favorite holidays. 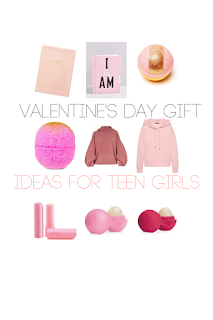 I compiled a list of some of my favorite items to get for the teen girl in your life. These are all great gift ideas. I really like the sweatshirt and the sneakers. Pink is one of my favorite colors so I'm loving all of these gift ideas. oh my gosh i have a few friends w/ teenager girls who would LOVE all of the items you found ha! that cute pink sweatshirt i might even snag myself ! Great group of items here for girls of all ages and what they might enjoy! You have chosen some wonderful items as gift ideas. There are all range of prices and things a teenage girl would enjoy receiving. What great ideas! I have a tween who would like these. But we normally just do chocolate and candy for Valentine's Day. These are definitely some great ideas. We have a few teen girls close to us that I was trying to think of ideas for. These are some really cute ideas! I am loving the idea of a lip balm or bath bomb I'd be happy with that. I have a 17 year old niece who would love ALL of these. I 'm sharing with her mom, potential gifts throughout the year! I don't have to buy gifts for a Teen Girl but if I did your list would come in handy. Although I found Gifts on your list I wouldn't mind having for myself. I'm a huge fan of the color PINK! Never mind the teens...I want them all, lol!! I have several of those EOS lip balms. My daughter likes them, too. She is not a teen yet but she likes several of these items already. These are great ideas for Valentines Day gifts. Much better than candy! These are a lot of great gift suggestions. We never really gave our kids Valentine's gifts except a big box of chocolates for the family to share. I definitely see a number of these that my teenager would love! I'm bookmarking for sure! Unicorns are so popular right now. My wife has a unicorn tank top for working out. There are currently no teens in Babushka's casa, but some of these items are CUTISIMO and would be appreciated/loved by any age. Gracias for the great gift ideas. Thank you for these wonderful gift ideas. When my daughter turned into a teenager, her preference for outfits changed drastically. She was a girly girl back then but now all she cares about is hoodie and jeans! I am loving this entire list of gifts you put together - especially that most of them are pink! That bath bomb looks like tons of fun.